Our precisions springs are designed and meticulously constructed to fit your precise application, every time. Compression Springs: Even these common springs can be customized any way you want them to be. You can choose your coil shape specifications, wire material, stress tolerance and so much more. 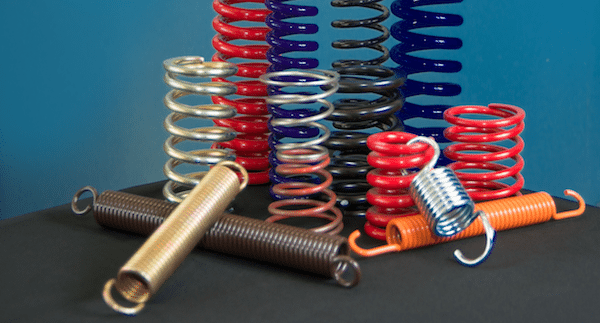 Torsion Springs: Their distinct load capabilities make these springs perfect for a variety of products and applications. When working with our team, they will help you find the right specifications that fit your specific products. Extension Springs: Also known as tension springs, these stretchy springs are reliant upon the initial tension that you choose for them. These spring designs are dependent on how much weight you want the springs to hold, among other considerations. Springs don’t have to come in the traditional coiled shape. Our precision wire forms are versatile and can be engineered with as many factors as our diverse range of springs. Our team can bend different types of wire into any shape and length that your application requires. They can also create custom stampings from flat metal pieces, all complete with any holes, slots, bends and anything other custom specifications that you require. When working with our precision spring manufacturers, accuracy counts. All you need to do is tell us the precise spring specifications you require and we will use the latest software and technology, backed by our more than 100 years of experience, to create precision springs that are one of a kind. It’s a complicated process, but getting started is easy. All you have to do is contact our team for a quote. With just a few basic pieces of information, we will be able to get your order started right away. Not sure how to fit your order into your next budget, go ahead and request a quote from us. We are more than willing to provide you with all the information you need to make the best decision possible.